Blast off into space aboard the high-tech Utility Shuttle! Join the astronauts on a spacewalk high above the earth as they launch a new satellite into orbit. Open the cargo bay doors and slowly lift the satellite into position, then fold out the solar wings and use the wrench to tighten them into place. When you’re done, close the cargo bay doors and head back to earth for the next exciting LEGO® City space mission! 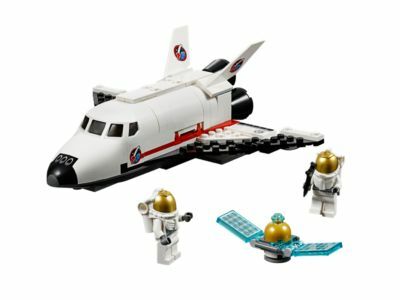 Includes 2 astronaut minifigures with an accessory. Last known price is 60% above the initial Lego retail price! The Utility Shuttle (60078) Lego set is no longer directly available from the sites below. However, 3rd party partners of these sites might still have the set available. Alternate description Join the LEGO® City astronauts aboard the Utility Shuttle, with opening cargo bay doors and a satellite with foldout solar wings.